An active duty military officer, father of six and doctoral student in MU’s Sinclair School of Nursing, John Rossi is the walking definition of balance. 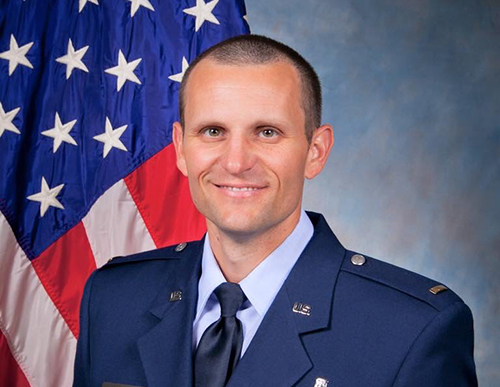 Not only does he serve as a full-time military nurse, but he’s also an incredibly involved parent, sharing homeschooling duties with his wife, Nancy, for five of their six kids. Although some days can feel more chaotic than others, John has been a hard worker and goal setter for his entire adult life. So when he set his sights on finding a highly ranked graduate nursing program that would fit into his busy life, MU’s SSON climbed to the top of his list. Although John’s journey to the DNP program was a practical progression in hindsight, it’s a long way from where he started nearly two decades ago. John joined the military right out of high school in 2001 and spent nine years as an enlisted member of the U.S. Navy as a helicopter search and rescue swimmer. He enjoyed a successful career and a lot of opportunities, but the repeat deployments were becoming more and more difficult with his growing family at home. It was at Brigham Young where John earned his nursing degree — a Bachelor of Science in nursing and gerontology. That was three years ago. Today, John is stationed at Wright-Patterson Air Force Base, just east of Dayton, Ohio, where he works full time as a nurse at Wright-Patterson Medical Center. It wasn’t long after starting his first full-time nursing position that John realized he wanted to return to school for his doctorate degree, which probably didn’t come as a surprise to those who know him well. John and Nancy, who have been married for 15 years, homeschool their children, with John teaching science and history and Nancy teaching the rest. Nancy also recently went back to school for her bachelor’s degree. John says the structure of SSON’s program itself has been a big factor in his ability to balance his various responsibilities — both the expected and unexpected. He also notes a difference in his approach to nursing since beginning at MU. John’s balancing of a full-time workload with family life and school means there are no 18-credit-hour semesters in the cards, and the path to the finish line is slow but steady. Taking a course or two at a time, he’s on track to graduate in May 2022. But it’s not a race — it’s about the end goal.